We take a break this week on Herriman Saturday from our regularly scheduled LA Examiner cartoons for this late-breaking news: Mark and Cole Johnson, whose prodigious memories are to be questioned only if one likes to eat crow, have sent me the above episode of Musical Mose. You'll recall that we covered that strip as an obscurity about a month ago, and Mark shortly thereafter mentioned that he seemed to recall an episode running in the North American. I disagreed, saying that my indexing of that paper indicated no such occurrence. A week or so passed and brother Cole sends me this scan, which he assures me is from the March 9 1902 issue of the North American, my index notwithstanding. 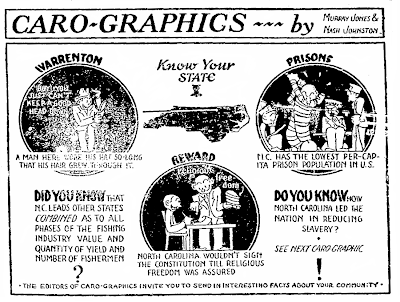 Presumably the comic section I indexed on microfilm was incomplete or I just plain missed it. The remaining question, then, is whether this episode also ran in the New York World, or if it ran only in the North American. If it did run in the World, did it run on March 9? Or is it the one remaining episode of February 16 not printed with my earlier blog post? Sadly all these questions are, at least for the moment, unanswered. The Feb 16 World episode of Musical Mose is "Musical Mose 'Impussanates' a Scotchman, With Sad Results." I never saw the "Exclusive Professions" episode in the World comic supplement during this period, though I have a vague memory that at least one Mose got picked up by some other paper. I really like the Garibaldi picture in the first and last panels of this one! 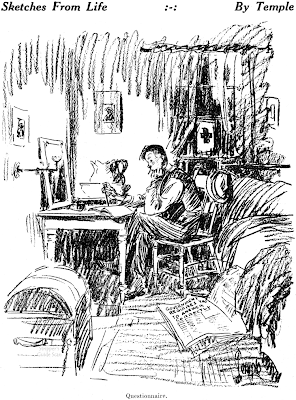 It would seem that Herriman was short a cartoon for the NA, and he had a Mose already drawn, so he sent that. He had deadline problems all the time, probably because of his health. Not too long ago I was asked to help decipher the handwriting on the margins of a Krazy Kat original. It turned out to be his editor questioning him about late work! In any case, he got away with this switch. He isn't referred to as Mose, even though it's obvious it is. The transient nature of 1902 series strips meant nobody noticed. Harry Clifford Temple was born in Perry, Ohio on March 3, 1881 according to the Ohio, Births and Christenings Index, 1800-1962 at Ancestry.com. The 1880 U.S. Federal Census recorded his parents and two siblings in Perry. His father was a telegraph operator. He has not been found in the 1900 census, but his parents and two siblings lived in Berlin Heights, Ohio at the time. The Cleveland Plain Dealer reported, on October 29, 1905, Temple's marriage. Miss Edythe Nina Carvey, daughter of Mr. Judd K. Carvey, was married on Saturday, Oct. 21, to Harry C. Temple of Berlin Heights, O., Rev. Treat of Park Congregational church officiating, and the ceremony taking place at the bride's home, No. 11 Beulah street, at 4:30 p.m. J.W. Carvey, brother of the bride, was best man and Miss Bessie Temple, the groom's sister, was bridesmaid. The bride's gown was of light gray voile with Irish applique trimmings. She carried white carnations. The bridesmaid was gowned in white and carried pink carnations. A horseshoe of autumn leaves hung over the bridal party. After an informal reception and supper Mr. and Mrs. Temple left for the home of the groom in Berlin Heights, where they will remain for a short time before going to make their home in Ft. Wayne, Ind. Harry C. Temple is a country-bred Ohioan, educated in a red brick schoolhouse on an unimproved road. At seventeen he learned telegraphy, and advanced until he became an assistant dispatcher. Later he entered an art school, but returned occasionally to railroad work. Finally he landed with the Cleveland Plain Dealer, where he developed his distinctive Sketches from Life, which have been featured in that paper for several years past, and have been extensively syndicated throughout the country these past three years. He is a fisherman by instinct, but most of his recreation is work. 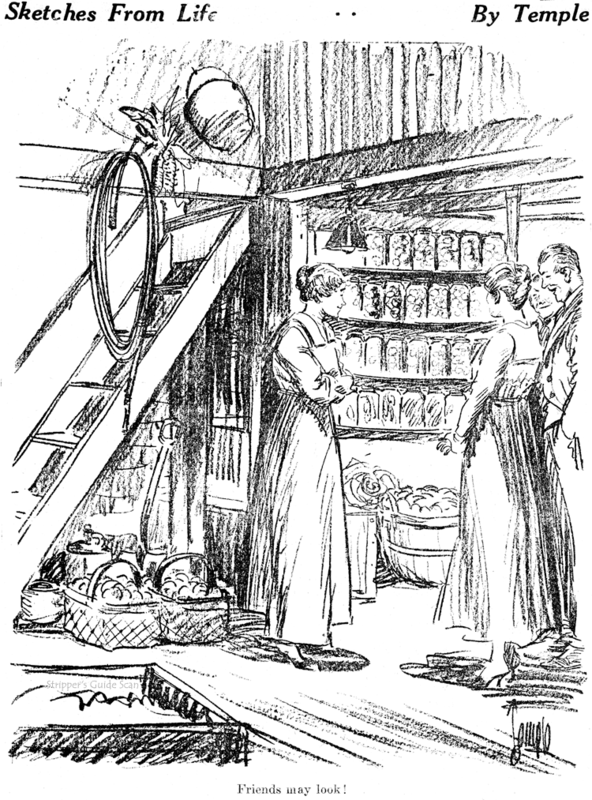 As his sketches indicate, his principal interest is in folks, every-day folks, of the kind you see wherever you go. He signed his World War I draft card on September 18, 1918. The home address is illegible. His occupation was artist at the Cleveland Plain Dealer. He has not been found in the 1920 census. In 1930 he lived in Manhattan, New York City at 3 East 27th Street. He was a commercial artist, and his wife was a jewelry craftswoman. On August 9, 1935 the Kingston Daily Freeman (New York) covered his watercolor exhibition. Harry C. Temple of Woodstock, has an exhibition and sale of water colors at Gregory & Company, Broadway, for the last three weeks in August. There is a variety of subjects and each one is handled with sympathetic understanding. Mr. Temple shows a thorough knowledge of color which few artists seem to possess. His "In the Hemlocks" is strong and masterful, while "Nature's Lace" is delicate and beautiful in color in pattern; "Sky Shadows" is dreamy and skillfully handled; "Portland Harbor" brings back pleasant memories and is peaceful and charming. Each subject has its special appeal and the exquisite harmony and beauty of color make any one of them invaluable as a center of interest in the well furnished room. Then too, they bring close at hand things we all love to see. Mr. Temple is to be congratulated on his splendid contribution to art. Temple passed away on November 2, 1962, in Woodstock, New York. His death was reported the following day in the Kingston Daily Freeman. Harry C. Temple of 79 Yerry Hill Road, Woodstock, died Friday at his residence. He was born in Perry, Ohio and was one of the earlier Woodstock artists. He had been a resident of Woodstock for the past 43 years. Fraternally, he was a member of the Kingston Lodge 10, F&AM and the Woodstock Country Club. Surviving is his wife Mrs. Edith N. Temple. Funeral services will be held Monday 2 p.m. at Lasher Funeral Home Inc., Woodstock. The Rev. Donald Hicks, pastor of the Dutch Reformed Church, Woodstock, will officiate. Burial will be in Woodstock Cemetery. We tend to think of comics as raucous things, and when something comes along that is quiet, elegant and sophisticated we instinctively want to categorize it as something else. 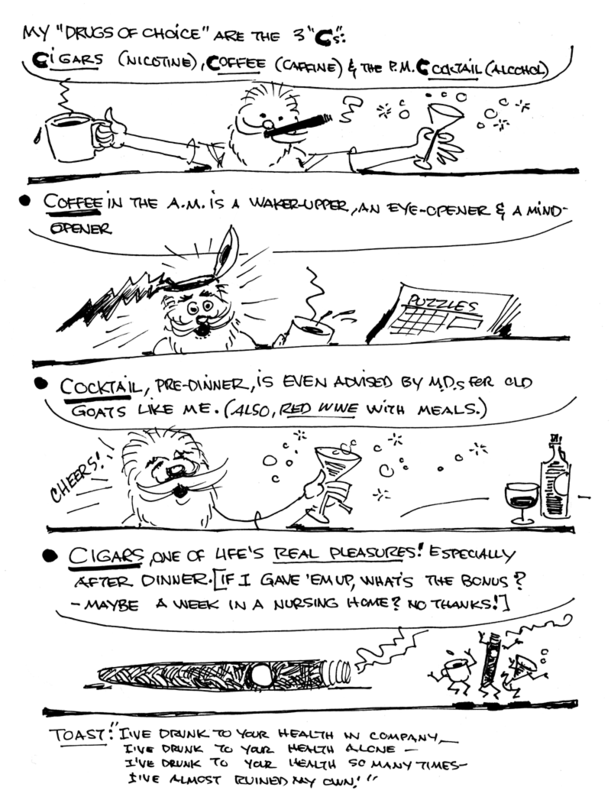 I proudly declare, though, that Sketches from Life is a cartoon panel. 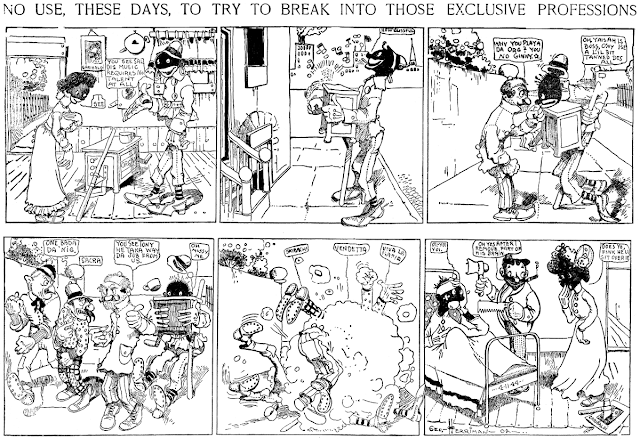 Cartoonist Harry Temple never went for the belly laugh, and in fact often drew pictures that were just observations of everyday life with no particular attempt at humor. His panel cartoons are sometimes wistful, occasionally even sad. But what they are most often is deftly drawn and quietly powerful. Try to imagine something like Sketches from Life appearing in your daily paper -- a little eddy of somber reflection in a sea of headlines about war, crime and dirty politics. If you were a newspaper editor, would you see the value of Sketches from Life? Not many newspaper editors did take the feature, but those who did tended to be very loyal to it. I can certainly see why that would be. It seems to me readers could get quite addicted to a few square inches of calm meditation amid all the clamor and commotion of the news. 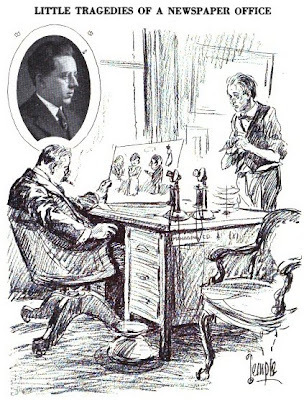 Sketches From Life was produced for the Cleveland Plain Dealer from September 17 1913 to November 24 1926. The Plain Dealer seems to have used World Color Printing as the syndicator of the feature for most of its life. There is some circumstantial evidence of a distribution relationship, perhaps short-term, with either Associated Newspapers or the Philadelphia Inquirer, too. 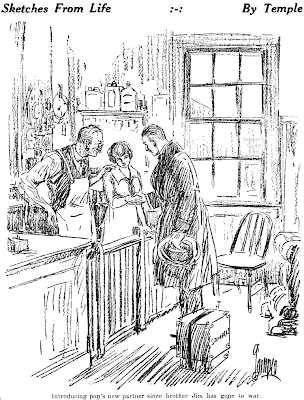 A book collection of the feature was issued in 1915 by World Color Printing, but there must have been a terrible distribution problem. The book is extremely rare -- I have never seen a copy for sale, and WorldCat shows copies of the book at only three libraries in the country. The situations and overall tone, if not the actual drawing style, reminds me a little of Norman Rockwell. I just found the book with items that belonged to my mother who was born the year it was published. After scanning its wonderful drawings I would not be adverse to making it available to a collector. Any advice? Put it on ebay and leave us a note. I'm sure some collectors will be interested. Thank you for your enlightening blog about this charming little book. I just posted a response then recalled that I had not responded to your comment that "there must have been a terrible distribution problem." This notation on the title page of the book holds the answer to your mystery: "This book printed for gift distribution only, is limited to 1,000 numbered copies of which this is number 858 and all copies have been distributed The Plain Dealer First Newspaper of Cleveland Sixth City 1915"
I imagine that the dearth of library copies is due not only to the tiny number printed but the gift-distribution factor. Probably most of those still in existence are in attics--or the private collections of the discerning. For your interest and enjoyment I'm sending you scans of the cover and title page in both PDF and MS Word formats. Thank you again for posting your blog on this subject. As you noted, copies appear to be very rare. There's no ebook listed on googlebooks, and apparently neither that outlet nor Abe books has a hard copy. Before resorting to ebay I'll consult a local antiquarian book expert I've dealt with before. I too have a numbered print of Temple's "Sketches from Life", #790 of 1000. In your post you mentioned consulting a book antiquarian as to the books rarity. Were you able to garner any useful information? Ink-Slinger Profiles: Murray Jones Jr.
Murray Jones, Jr., I believe, is William Murray Jones, Jr. who was born in Durham, North Carolina on November 5, 1915, according to his Army registration card at Ancestry.com. He was the only child of Murray and Jeanette. According to the 1920 U.S. Federal Census, they lived in Wilson, North Carolina at 310 Park Avenue. His father was a tobacco buyer. ...While Durham had many practicing artists by the decade of the 1970s, it had not been devoid of native talent in earlier times, and contrary to the contention of the Atlantic Monthly article that the arts were the province of Durham's women, the 1930s produced a group of men who became professional artists. Both the time and the place, however, made earning a living by art impossible, so that if they intended to stick to their last they had to go elsewhere to survive. In that decade appeared Nelson Rosenberg, Eugene Erwin, Ralph Fuller, Jr.*, Murray Jones, Jr., and Nathan Ornoff…. In 1939 when he was 24, Jones registered with the Army, according to his Army registration card at Ancestry.com. He was a student at Duke, and described as six feet and a half-inch tall, weighing 143 pounds, with hazel eyes and brown hair. The Shirley Jones Gallery said, "…Jones entered the Chicago Art Institute in the mid-1930s where he studied painting, drawing and the graphic arts. He graduated with an MFA degree in 1939." 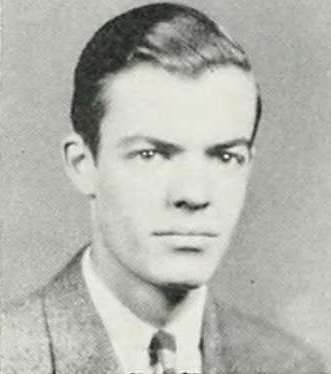 The May 23, 1939, Chicago Tribune story, "3 Art Institute Janitors Picked for Trip Abroad", said, "The student-janitors, who won awards of $1,500 each, are: Murray Jones, 24 years old, 17 West H- street, who comes from Durham, N.C…." The Detroit News, January 31, 1998, profiled Jones and said, "Murray Jones received his MFA at the Art Institute of Chicago in 1939, then traveled to Tahiti and Latin America…." In 1940 he was an instructor at the Summer School of Painting in Saugatuck, Michigan, according to ads in Arts Magazine 1940. According to Shirley Jones Gallery, he served in the Army during World War II. The Detroit News said, "He joined the faculty at Michigan State University in 1946…" A June 30, 1946 news release from Art Institute of Chicago announced "Paintings by Janet and Murray Jones, and Maurice Ritman, exhibition". 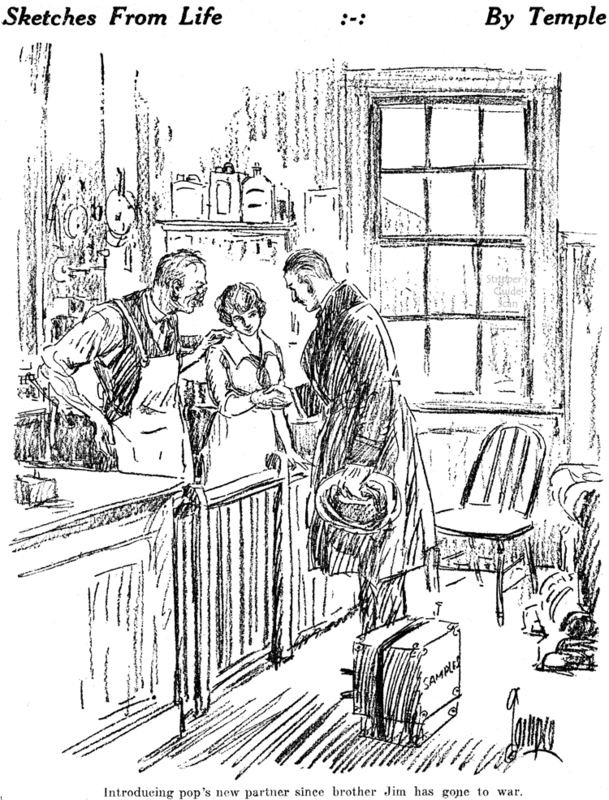 The date of Jones's marriage is not known. Their son Michael was born in 1946, according to Shirley Jones Gallery. Time Magazine published his letter in its January 13, 1947 issue. Shirley Jones Gallery said, "From 1959-61, Jones lived and worked in Kyoto Japan under the sponsorship of a Fullbright Research Fellowship….at Michigan State University...he taught until 1962 at which time he accepted a professorship at Ohio State University…." 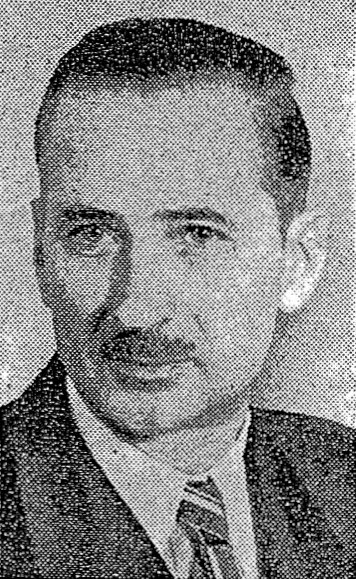 Jones passed away in 1964. In a 1985 issue of Dialogue, from the Akron Art Institute in Ohio, Dale Newkirk said Jones died of multiple sclerosis. Murray Jones 1915-1964: A Memorial Exhibition was published in 1965. 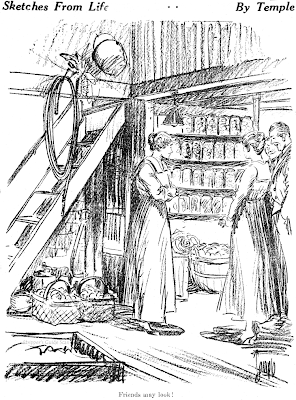 * Ralph Fuller Jr. (1904–1972; no relation to Ralph Fuller of Oaky Doaks fame) may have been one of the artists who worked on Caro-Graphics; a cartoon in yesterday's post was credited to "Fuller and Johnston". Fuller, a Georgia native, grew up in Durham. 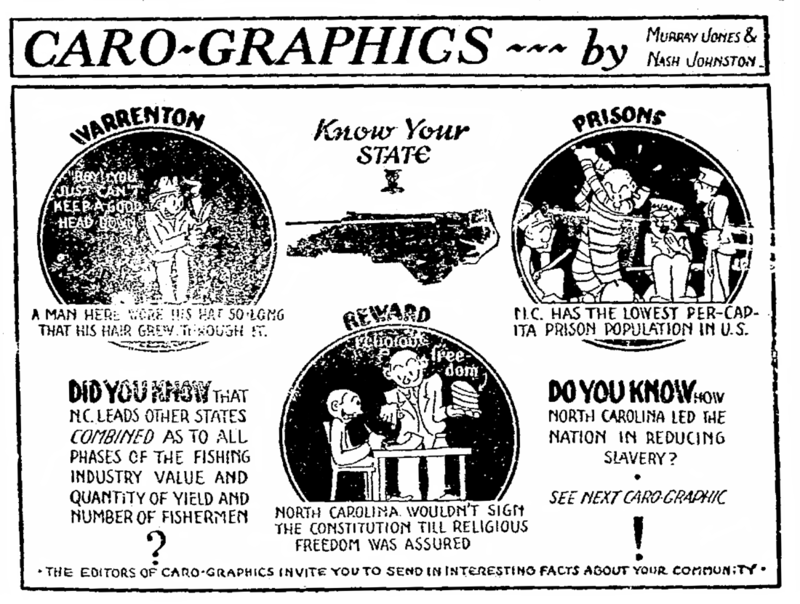 Johnston might be Samuel Nash Johnston (1906–1937), a North Carolina native, who died of acute nephritis. Another possibility is "Nash Johnston" is a pseudonym; Nash and Johnston are counties in North Carolina. 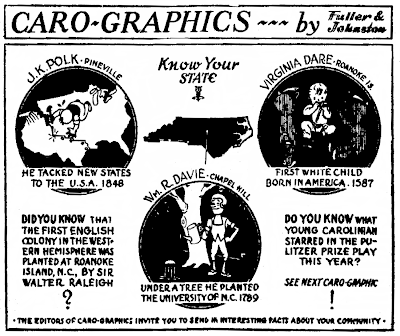 I was contacted by Lew Powell, who hoped I would have some words of wisdom to say about Caro-Graphics, a feature he found discussed on this North Carolina history site. Unfortunately I have to admit to Lew that I'd never heard of it! 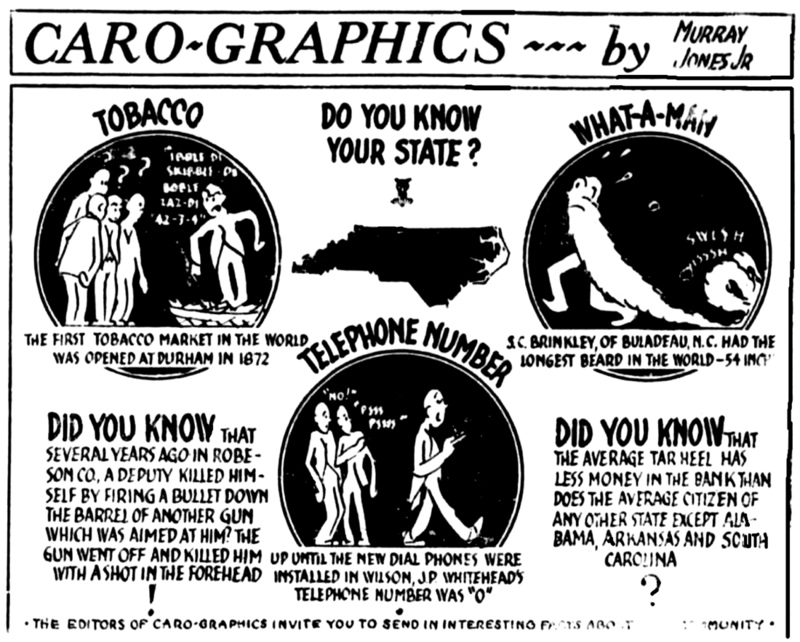 Caro-Graphics is one of the many features that have come and gone over the years that tell factoids about a state, region or city. I doubt that there is a state in the union that can't boast a few of these features. 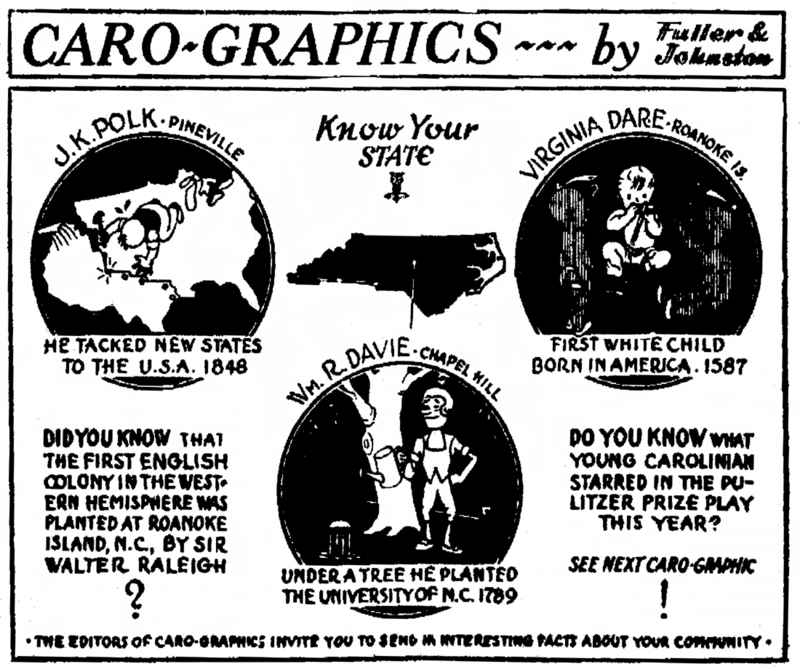 Caro-Graphics focuses on North Carolina, which makes it two known for that state; the other being Carolina Hall of History. Armed with the knowledge that the feature existed, some online searching revealed that it ran at least 1933 to 1937. The earliest samples carry credits to Nash Johnston and someone named Fuller. I believe they were both writers on the feature; Johnston was for sure. 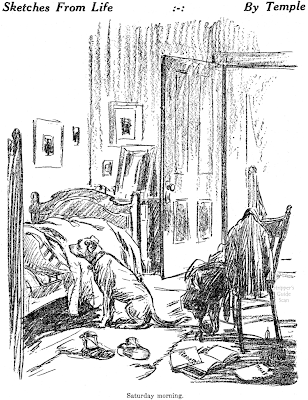 I say Fuller was a writer, too, because the art remains consistent throughout the life of the feature, and seems to have been by Murray Jones, Jr. throughout. I guess Jones didn't ask for credit early on. By late 1934 Fuller has disappeared, and then by 1937 so has Johnston, leaving Jones to presumably fend for himself as both artist and writer. Unfortunately I found no paper that ran the feature consistently or long enough to give more definite credit dates than these. The writing is run of the mill for this sort of feature, but Jones' art is certainly an asset. Pleasingly stylized and slick, it really makes the feature quite attractive despite the awful reproduction of these samples, all found online. Thanks to Lew Powell for putting me on the scent! You're a stalwart researcher, Allan. 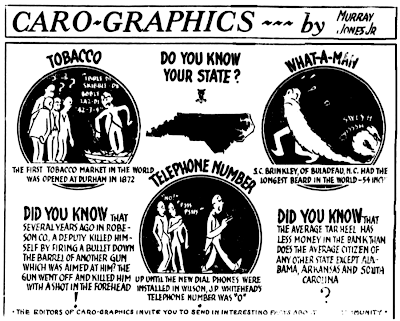 Many thanks for making this shard of North Caroliniana considerably less obscure.